Ubisoft put us in a rural violence mood with its first Far Cry 5 teaser trailers and now this teaser art is making good on it. Are you ready to shoot your way across an open world, attempting to foil the plans of another charismatic villain? What if I told you that you could probably fly planes this time and the villain has a cult? Let's take a look at every little detail we can glean from this art. 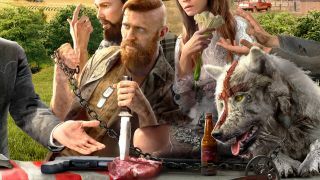 First up, here's the full Far Cry 5 teaser image, which references Leonardo da Vinci's The Last Supper. If previous Far Cry cover art is anything to go by, we have our main villain right here (or at least the most interesting villain, sorry Hoyt). He's the best-groomed guy in the picture and he's sitting squarely in Jesus' seat from The Last Supper. Note how he's dressed in shades of gray, with a graying beard and hair, and even gray eyes under his yellow aviator shades. But at his most vulnerable point - his neck - he wears what looks like a black minister's collar (they're typically white). I think we're looking at a man who wraps himself and his followers in convenient uncertainties and contradictions, but is undeniably evil at his core. I'm not going to analyze each of the good ol' boys in full detail, but take note of the fact that the guy with the long, unkempt hair and beard is sitting in Judas' seat from The Last Supper. He's reaching out to the man in the center, as if to ask (or demand) something from him. He also looks generally unimpressed even as the others gaze in admiration. Taking on the treacherous role of Judas might actually make him a good guy in this situation - we could be looking at our first ally. Befriending wolves was one of the best parts of Far Cry: Primal. If the bad guys can have dogs, why not us too? Here's hoping. Why is that WW2-era fighter plane shooting down a seaplane? Well, it's not just a seaplane, for starters. Look closely and you'll see it's armed with machine guns and bombs. This is a pretty strong teaser for player-controlled planes in Far Cry 5, which would be a step up from the mini-helicopter featured in Far Cry 4. Can't have Far Cry without a bow! The man with "sinner" written on his back follows an unusual tradition of captives on the cover of Far Cry games. He's slumped over helplessly, looking utterly subdued, and with a bad case of bacne to boot. A tattoo on his left inner arm has the words "Forever" and "Ghost" visible. Are these the Ghosts and he's a disgraced former member, or could they be an opposing group? Is this a secret prequel to Call of Duty: Ghosts?! Probably not that last one. Far Cry is coming to America for the first time, but it looks like Hope County, Montana has its own way of doing things. Notice anything unusual about the flag situation here? Patriotically speaking, you're not supposed to fly another flag above the stars and stripes (nor are you supposed to redesign it with your religious symbol in place of the stars). That, and the same flag being draped over the nearby church, tells us something about this group's priorities. Meanwhile, the farm off to the right that's only flying a standard American flag is burning to the ground. I doubt that's a coincidence. For more big announcements that may be on their way soon, check out our E3 2017 leaks and rumors roundup.